Yaoundé - Journalist Emmanuel Freudenthal spent a week embedded with rebels from the Ambazonia Defence Forces who have been fighting against security forces sent by Yaoundé to quell unrest. His two-part series documents alleged abuses by the security forces and the stark choice some Anglophones felt they were left with – either flee across the border to Nigeria and become a refugee, or take up arms and fight the Cameroonian military. 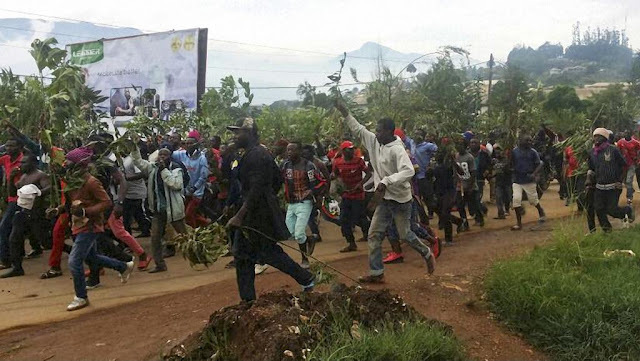 The crisis in Anglophone Cameroon has escalated since the end of last year when the separatists declared independence for so-called Ambazonia. Grievances among Anglophones over the lack of English in courts and classrooms originally took the form of protests and demonstrations. What was it like spending a week with the Ambazonia Defence Forces? What I’ve seen when I was there was perhaps 50 men in one camp and most of those used to be farmers who have been driven to attack the Cameroonian army in order to defend themselves. And to reclaim independence for the country they call Ambazonia. How many people would you say are in the Ambazonia Defence Forces? Cho Ayaba, who is the leader of the Governing Council that is linked to the Ambazonia Defence Forces, says there are about 1,500 people spread around 20 camps in Anglophone Cameroon. I’ve personally witnessed around 50 people in one camp and in total probably 100 fighters – adding up everyone I saw. Obviously, I haven’t been to the 20 camps. So 1,500 does sound quite possible, but it’s hard to establish exactly how many. They say 20 bases or camps. Did you get any idea of their geographical reach? I think they’re operating throughout the Anglophone regions. I stayed in one specific area in the south west, so I haven’t visited the 20 camps, I think that would probably take a very long time. But in that specific area they actually controlled a surprisingly large amount of land. That’s partly to do with the fact that the state hasn’t developed roads or means of access to many of the areas which means that the army can’t go there either. Ironically that’s also part of why many of these fighters are fighting and part of why many of the Anglophones are quite annoyed with the Cameroonian state. This lack of infrastructure, lack of roads – which is now biting back against the state when they would like to access a lot more of these areas. How sophisticated is their weaponry? Are we talking about automatic weapons? No. The weapons I’ve seen were mostly hunting rifles that are made in Nigeria. People for years have been hunting with them in the bush. Basically, to fire them you have to first unscrew it at the bottom of the rifle, then open the rifle, push a cartridge in, then close the rifle, then screw it back so that locks it in place. So it takes – even just to explain it, as you can see – it takes quite a while. They’re facing an army that has automatic assault rifles which might fire 600 bullets every minute. So you can see that it’s not quite the same weaponry. I’ve seen a few assault rifles within the ADF forces. And I’ve seen photos of a few more, but the majority of the troops don’t have them, they have these very basic hunting rifles. Did you get a feeling for how frequently they’re clashing or fighting with the Cameroonian security forces?That’s quite difficult to assess. I’ve seen some videos where they are clashing and they have carried out targeted killings. Amnesty International just published a report that says that the separatists have killed 44 members of the security forces. Not all of those would be part of the Ambazonia Defence Forces, but that’s the number they are giving. While I was there they were planning an attack, but that attack didn’t work out because of logistical issues. They were waiting for some ammunition, which never came. Just tell us a little bit more about their endgame - because in your story the fighters talk about defending communities against alleged abuses by Cameroonian soldiers. What do they want? What’s their endgame? Their endgame is very clear. Its separation of the country they call Ambazonia from Cameroon. That’s very clearly what they’re fighting for.